Favorite North Fork Places. Ali Katz Kitchen. 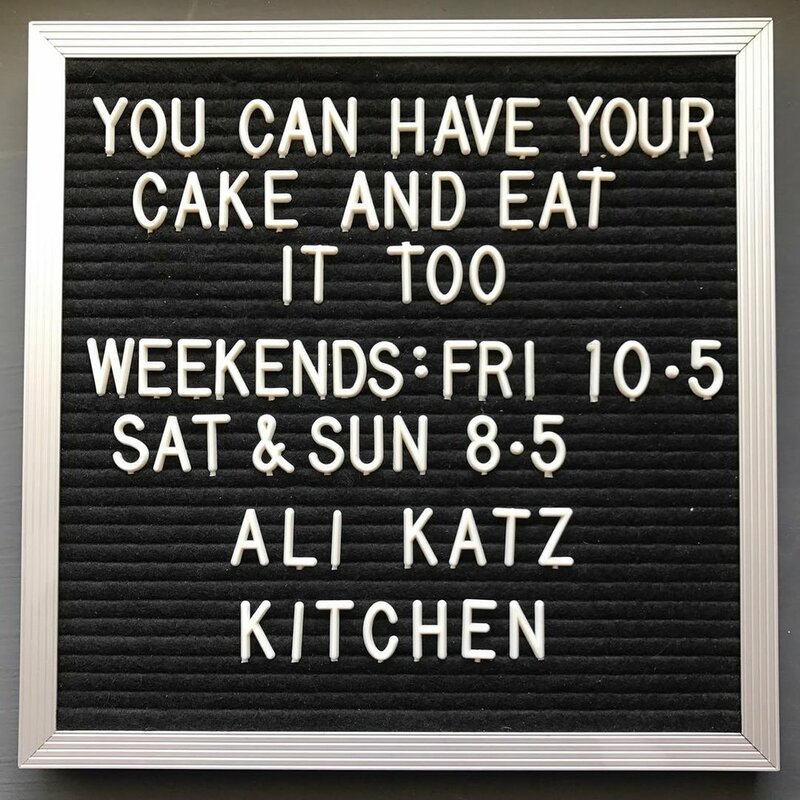 A few weeks ago, my friend’s birthday gave me the perfect excuse to stop in to Ali Katz Kitchen. Allison Katz, AKA, Ali, is without question among the best bakers on the East End. And I was looking for a special cake—one that wasn’t too sweet, with flavors that were pure, subtle and fresh, and for this particular friend, that wasn’t chocolate. I had been wanting to stop in to see Ali since she opened this past July. 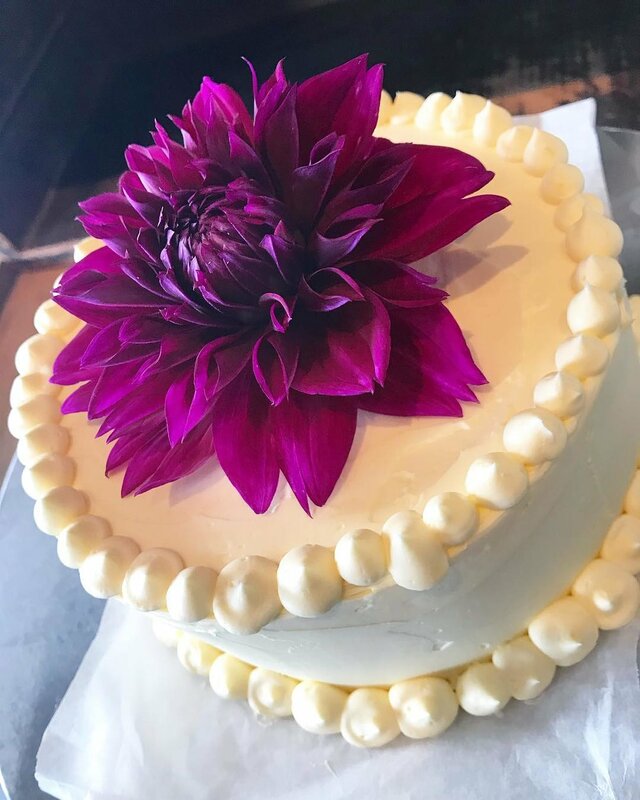 We’ll get to Ali in a second, but cutting to the chase, the perfect cake was waiting for me there—a white cake with lemon curd filling and butter cream icing. And, a gorgeous eggplant colored dahlia on top. It was as exquisite as it was delicious—and our guests had seconds too. It was great to see Ali in her new digs. We met about 5+ years ago through my husband who knew Allison and her husband (also a chef!) Fritz. I also knew Ali from Goodfood, in Mattituck on Pike Street, where she was until last year partners with Luchi Masliah, who still owns and operates GF—happily! When I came in to find the special cake and to visit Ali in her new shop, we started to catch up, and a light bulb went off—one of the things I envisioned for Hummingbird is a look at—an insider’s view—of some of the local “treasures” we have here on the North Fork, and also in the neighborhoods we explore in Brooklyn. So, when I was telling Ali about Hummingbird, I asked her if I could interview her and feature Ali Katz Kitchen—we set up a date last week, and here it is. We had a lovely, free-wheeling, hour and a half conversation, touching upon the kinds of topics I knew HB readers would be interested in. When we were speaking, and then again when I went back to my notes to begin writing, I saw how certain themes wove their way through the story of how Ali is where she is today, which enviably sounds like just the right place. Creativity, love of family and friends, quality of life, sense of community, farm to table, and delicious food is what it’s all about. In the first chapter of Ali’s professional life, during the 1990s, she was involved in design and sales as a merchandiser in the fashion industry. At first it was exciting—she was both creative and challenged, and enjoyed traveling to source fabrics and the like. It is during this time that she honed her design skills, which are evident in her work today--from the decorating of cakes, to her label, to her eclectic storefront shop. In 2002 Ali decided to pursue her love of cooking and enrolled in the French Culinary Institute in Soho (now the International Culinary Center) completing the program in 2003. Although she always gravitated toward baking, she pursued the “chef’s” program, not wanting to limit her potential opportunities after graduation. From Pastry Chef at the Boathouse to Private Chef for an Advertising Agency, Ali cultivated her passion for the culinary arts, incorporating her sophisticated aesthetic sense. While working as a Private Chef, she also began working at the Calhoun School, which progressively employed “real” chefs in their kitchen. This position enabled her to have summers “off,” which worked well with her personal life. Her parents had retired in East Hampton, and her mother had been diagnosed with cancer. Ali wanted to be sure that she had plenty of time to spend with her. She worked at the Ross School and spent her summers there. Soon after her mother passed away, Ali and Fritz, while still keeping their apartment in Brooklyn (that famous North Fork Brooklyn connection! ), decided to try their luck on the East End full time. Can One Have a Culinary Career and a Life? Ali says that during the summer of 2013 is when she and Fritz got entrenched in the food community here on the North Fork. During the summer, Ali and Fritz operated the “pop-up” dinners at Kyle’s on Shelter Island, while Kyle did breakfast and lunch. Also that summer, Ali became involved with the SI Farmer’s Market — on the grounds of the Shelter Island Historical Society — selling her baked goods there. It was at the Farmer’s Market that Ali met K.K. Haspel, Holly of Browder’s Birds, Ann Marie Borghese, the Fokines and others. During this period, Fritz operated the food truck for the North Fork Table and Inn, while Ali worked with renowned pastry chef Claudia Fleming. Fritz and Ali felt connected here—in addition to the beautiful locale, they appreciated the hard working people, their pride in their products, and the sense of community. Ali began providing quiches to Browder’s Birds, and baked goods to the local North Fork farms and also to several farm stands and shops on the South Fork as well. Unexpectedly, in 2015, a mutual friend called Ali to let her know of an opportunity that she thought Ali might be interested in…Luchi was planning to open a food store/restaurant in Mattituck, and at the last minute her partner backed out. Ali and Luchi met, and they found that in fact they do have many skills that complement the other’s, and good for all of us, Goodfood was born. While Ali loved the customers and many aspects of the business, after more than a year, the increasing administrative responsibilities of a growing business coupled with a significant personal challenge gave Ali reason to evaluate how she was spending her days, as one rolled into another. She realized that despite the integrity and quality of the enterprise, it wasn’t consistent with her own personal professional vision. OK, so I just have to ask this question. 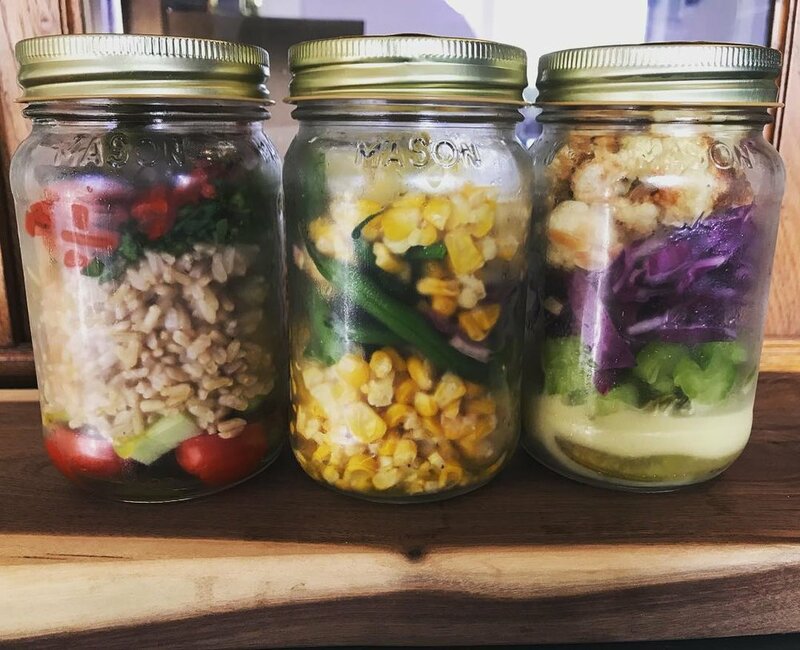 Where was I when “salad in a jar” became a thing? Probably with my head buried in some blog analytics or something. Regardless, Ali has taken this trend to a whole new level. The basic idea is that the dressing is at the bottom, and all the fresh veggies and other great ingredients are added in layers above. When it is time to eat, one just opens the jar and turns it over into a bowl, and voilà! There it all is with nothing crushed, everything perfect and the dressing on top!! How great is that? Ali has them in the shop, but also they can be found daily at The Giving Room in Southold. 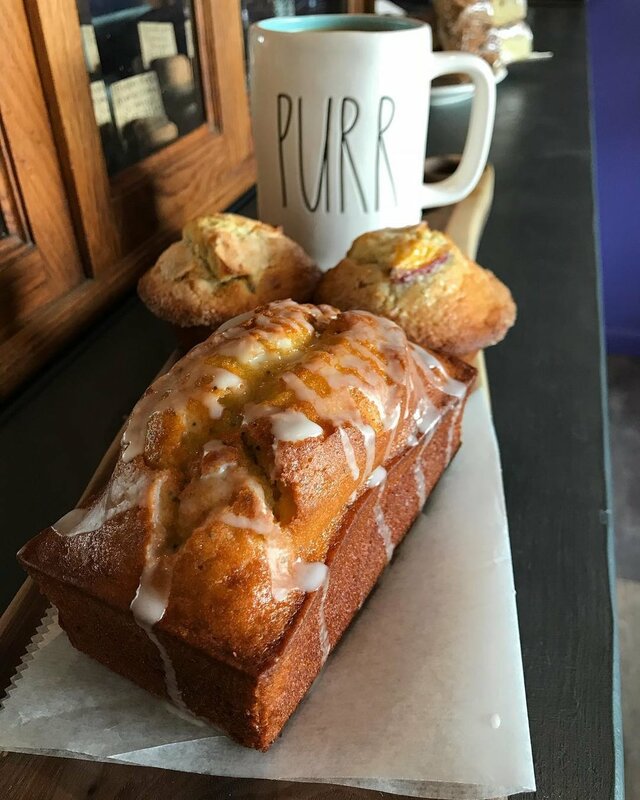 Ali Katz Kitchen products, made by both Ali and Fritz, including these and other delectable foods and baked goods, are found at The Giving Room, Browder’s Birds, Deep Roots Farm, Peconic Cellar Door, Lucharito’s, Borghese Vineyard and other select locations on the East End. Ali feels that she has a good balance now. On Mondays, she still works as a Private Chef for a family in Tribeca that has been her client for 14+ years, and Tuesday, she gives herself the day off!! Wednesday and Thursday, she works with Fritz on their wholesale orders, and Friday, Saturday and Sunday, all of us get to buy the most fabulous foods one can buy—at Ali Katz Kitchen—when the retail shop is open. Baking for the shop and special orders, of course, are integrated into the schedule! Well, me being me, I had to ask! Here’s the scoop—pop up “Supper Club” at Ali Katz Kitchen over the winter!!! Sign me up! And also ideas about cooking classes, including for children, “Dinner Gift Certificates” – I begged for this—what a fantastic gift! !—and cookie baskets for the holidays. She couldn’t give over all of her secrets… I could tell Ali still has a few surprises up her sleeve. The most important part of what is next, though, is Ali and Fritz enjoying the life they are making on the North Fork—including sunsets over the Sound, drives through New Suffolk, dinners with friends, and sharing the love and support of the community of which they have become an integral part. Note: I have to confess that while I was interviewing Ali, the scents coming from the kitchen were mouth watering. Fritz came out and “made” us taste a turkey stroganoff he was working on. It was a tough job—but it came with the Hummingbird territory, so I had to. Oh my goodness, it was so good. Mar 3 Recipe. You Won't Want to Miss This!